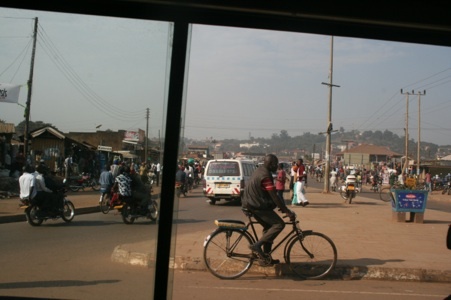 James Evans focuses on boda-boda motorcycle taxis in Uganda to ask how current thinking in Geography might help us re-think the role of informal transport in achieving more inclusive and sustainable urban development. This is of crucial concern as unregulated transport is vital to billions living with poor road access in the Global South, yet is increasingly marginalised in transport policies intended to modernise cities. Boda boda motorbikes in Kampala. Photo by Jennifer O’Brien. It is impossible to visit the Global South without being struck by the variety of transport at street level. Rickshaws, tuk-tuks, jeepneys, minibuses and bikes appear in all sorts of motorised and non-motorised forms across cities in Asia, Africa and South America. 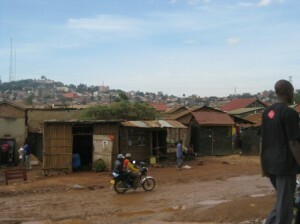 Kampala, the rapidly growing capital of Uganda, is no exception. Synonymous with its unregulated army of motorcycle taxis, so-called boda-bodas dodge and weave through the congested streets and alleys with passengers clinging on to the driver. Boda-boda taxis are part of African bicycle culture, originating as a way to cross the Kenyan-Ugandan border in the 1960s and subsequently spreading through East Africa as an industry with relatively cheap entry costs for migrants. In 2010 the Kampala Boda-Boda Association estimated that there were upwards of 200,000 boda riders and 5,000 stages (stops) serving an urban population that has doubled in the last 20 years to some 1.5 million people. Offering affordable transport to the poor, boda-bodas are more efficient in terms of fuel, space and maintenance than cars. These kinds of informal modes of transport play an essential role filling the gap left by the absence of planned transport infrastructures and have grown at the same breakneck speed as the cities in which they exist (Cervero, 2000). Estimates suggest that informal transport accounts for 80-90% of public transport journeys in medium sized cities (Luthra, 2006). 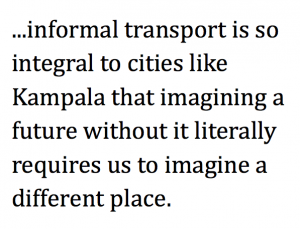 Manifesting what Simone (2011) terms the distinctive mobility of the African city where movement is essential to daily survival, boda-bodas support the “thickening fields of social relations” that city dwellers depend on. Flexible and cheap, they contribute to the connectivity and resilience of the city, running errands delivering both goods and information in addition to providing personal transport (Aworemi et al. 2008). It is through informal urban infrastructures like boda-bodas that existing socio-economic relations find material expression in the city. Unlike slums that are often out of sight, informal transportation permeates and often defines the experience of an entire city. In response to a national road safety crisis that has been compared to HIV in terms of its national importance (Magoola, 2013) and the protestations of more affluent car-driving residents of the city, the recently formed Kampala Capital City Authority is attempting to bring the unruly growth of boda-bodas under control, leading to a long-running dispute between the boda-boda operators and the city authority over perceived attempts to cleanse the city of their presence (Red Pepper, 2013). It is the powerful versus the poor, but more than this it is battle between competing visions of the city (Baviskar, 2007). This is a story that we find repeating itself from Shanghai to Lagos, leading to calls for new thinking about the role of informal transport in urban development (Pirie, 2014). Delhi may have famously failed in their attempt to ban motorised rickshaws in 2010, but Chinese cities have progressively banned various forms of two wheeled transport in the name of modern transport planning. Servicing the extent of the city. Photo by Jennifer O’Brien. The 2013 UN Habitat report Planning and Design for Sustainable Urban Mobility, which provides the nearest thing to a template for current global thinking on the issue of sustainable mobility, argues that robust land use planning is necessary to create urban landscapes that are amenable to more sustainable forms of mobility. But local transport solutions like boda-bodas question the validity of top-down planning approaches that seek to impose Western infrastructure on the city. Because informal transport infrastructures have developed incrementally with the city, they have shaped it materially and territorially (Lawhon, Ernstson and Silver, 2013). No doubt transport needs are dictated by the ways cities are planned, but equally the existing urban landscape reflects the kinds of transportation available. Changing the material form of a city is easier said than done; to the extent that things like existing houses, streets, wells and shops are obdurate, cities are locked into certain transport futures. 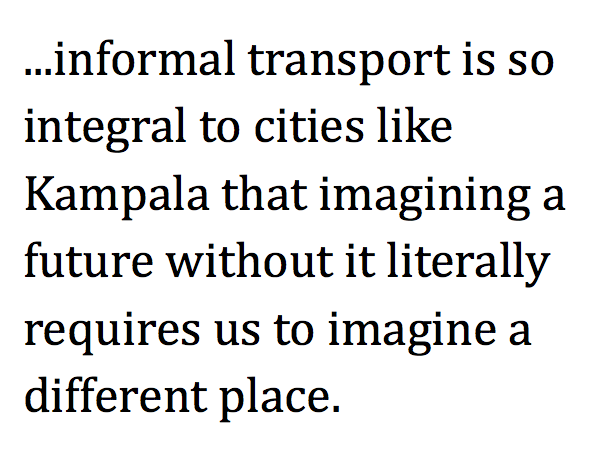 At the same time, informal transport is so integral to cities like Kampala that imagining a future without it literally requires us to imagine a different place. For the city to be in any sense sustainable and inclusive, informal transport has to play a part. While the idea that informal transport is more adaptable and thus potentially sustainable is not new, few studies have attempted to understand how its social functions are materially and territorially embedded in the city. More often than not, African roads are approached as a source of either terror or fascination by writers and commentators struck (not unreasonably) by their apparent chaos (Masquelier, 2002). Perhaps because of its poor safety record, motorcycle transport has received relatively little academic attention despite its importance to the billion people currently living in cities with poor roads. As Klaeger (2013) notes in an excellent introduction to the special issue of Africa on transport, researchers have focused on the impact of roads and road-building projects on local communities and cultures, but specific work on the day-to-day experiences of driving and using taxis is less common. One way to capture this relation between mobility and the city is to rethink informal transport as a materially embedded urban infrastructure. Recent research has shown how self-building technologies and sanitation in informal settlements unavoidably reflect material conditions and constitute something distinctive and different to the kinds of development that characterise Western cities (for example, McFarlane, 2008). In challenging received norms about mobility, the street-level practices of boda-bodas produce a very different kind of city to the ones commonly envisaged in planning documents and strategies. Focusing on the distinctive qualities of informal transport opens up new ways to think about infrastructure provision in the city and what a transition to sustainability could and indeed should look like (Swilling et al. 2013). Many basic everyday questions remain unanswered about boda-bodas in Kampala. For example, how do boda-bodas connect the city? Where do bikes circulate, what is their range, where are the stages, what routes do they trace, which parts of the city do they link and what are their working rhythms? What role do they play in circulating goods, people and informal knowledge? Beyond this, how is boda-boda infrastructure embedded in the city? For example, how, where and when are bikes fuelled, stored, repaired, recycled, reclaimed and maintained? Where do the drivers live and what do they eat? Materiality matters. Just as political ecologists have shown how power is manifested in the material resource flows of cities (Swyngedouw, 2004) so it is possible to open up alternative visions of the city though materially grounded analyses. In Kampala, the city planning authority is potentially receptive, currently developing a low-carbon development plan (World Bank, 2013) in addition to finding itself at the centre of a major transport row. If current solutions like simply building more roads have failed as a strategy in the West then they certainly won’t solve the transport challenges faced by cities in the South, which are that much more acute. There is an opportunity to establish a new agenda for the study of informal transport and its role in achieving more sustainable and inclusive urban development. In the search for viable alternatives, the question of what we can learn from existing forms of transport like boda-bodas seems to be a valid one. Aworemi, J., Salami, A., Adewoye, J. And Ilori, M. (2008) Impact of socio-economic characteristics on formal and informal transport demands in Kwara state, Nigeria. African Journal of Business Management, 2(4) 72-76. Baviskar, A. (2007) Demolishing Delhi: World-Class City in the Making’ in L. Batra (ed.) The Urban Poor in Globalising India: Dispossession and Marginalisation. Kutumbakam Publications, Delhi. Klaeger, G. (2013) Introduction: the perils and possibilities of African Roads. Africa 83 (3) 359–66. Luthra, A. (2006) Para transit system in medium sized cities: problem or panacea? LTPI Journal 3(2), 55-61. Masquelier, A. (2002) Road mythographies: space, mobility, and the historical imagination in postcolonial Niger. American Ethnologist 29 (4) 829–55. McFarlane, C. (2008) Sanitation in Mumbai’s informal settlements: state, ‘slum’ and infrastructure. Environment and planning A, 40(1), 88-107. Pirie, G. (2014) Transport pressures in urban Africa: practices, policies, perspectives. In Pieterse, E. & Parnell, S. (eds) Africa’s Urban Revolution. Zed Press, London. 133-147. Simone, A. (2011). The Urbanity of Movement Dynamic Frontiers in Contemporary Africa. Journal of Planning Education and Research, 31(4), 379-391. Swilling, M., Robinson, B., Marvin, S. And Hodson, M. (2013) City-Level Decoupling: Urban Resource Flows and the Politics of Infrastructure Transitions. UNEP, Nairobi. Swyngedouw, E. (2004) Social Power and the Urbanisation of Water: Flows of Power. Oxford University Press, Oxford.